This week marks two years since the introduction of the Payday Loan industry’s voluntary charter to govern their conduct. 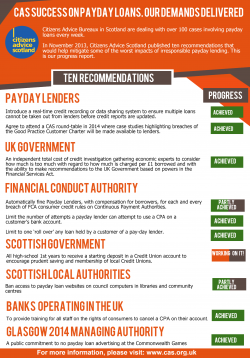 Citizens Advice Scotland closely monitored payday lenders’ behaviour – and we made recommendations as to what needed to be done. Nine out of Citizens Advice Scotland’s ten recommendations outlined last year have been met – but the industry’s products are still causing issues for thousands of consumers in Scotland. 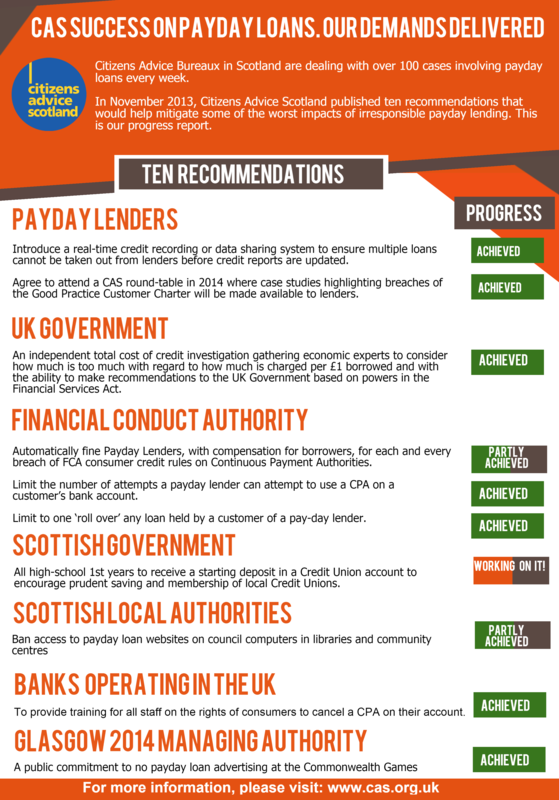 Two years on from the first moves to clean up the Payday Loans industry, Citizens Advice Scotland is pleased to see most of its recommendations implemented. Payday Loan Campaign successes in the last year include the introduction of real-time data sharing between lenders to stop multiple loans being taken out, a cap on the total cost of credit and a limit to the number of times a payday loan customer can ‘roll over’ loans. In spite of these improvements, Citizens Advice Bureaux across Scotland are still seeing almost 100 Payday Loan customers every week, showing that these remain high risk forms of credit. “It is very positive to see nine out of our ten recommendations have been achieved. Some of these changes will significantly reduce the risks of payday lending. In particular, the cap on the total cost of credit, the limit on ‘rolling over’ loans and the rules stopping lenders dipping into peoples’ bank accounts at will should end the worst problems in the industry. “However, Payday Loans have not overnight become a ‘safe’ form of credit – we are still seeing almost 100 people a week coming into Citizens Advice Bureau with a payday loan issue. Despite the new cap introduced by the FCA these loans remain an extremely expensive form of credit. Moreover, as the changes won’t come in to force until the new year, CAS are warning consumers to avoid such expensive credit in the run up to Christmas.